We finished viewing both Antelope Canyons by lunch time. After lunch we got into the car, and as we gathered ourselves for the long long drive ahead the husband had yet another change of mind. Our misadventure with American Airlines on Day 1 had earned us a $200 voucher. The car rental company told us we would save around $150 if we returned the car at Phoenix instead of at San Diego (SD) as planned earlier. If we didn’t drive we would save on gas. Two tickets from Phoenix to SD would cost us around $400. We bought ourselves flight tickets from Phoenix to San Diego. That however, was not the end of our roadtrip. 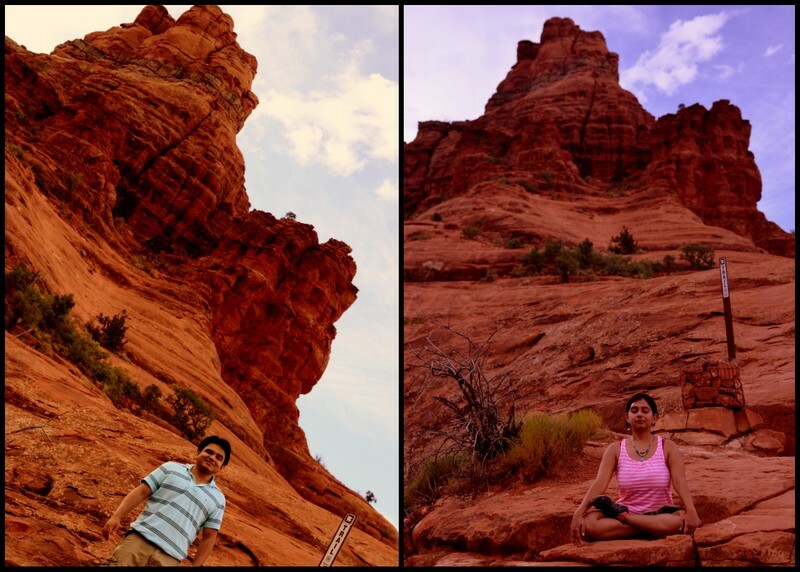 Since we had time to spare, we decided to drive down to Sedona before returning the car and taking the flight. Our GPS decided the adventure cannot end so soon, so it put us on a path through absolute .. absolutely nowhere. 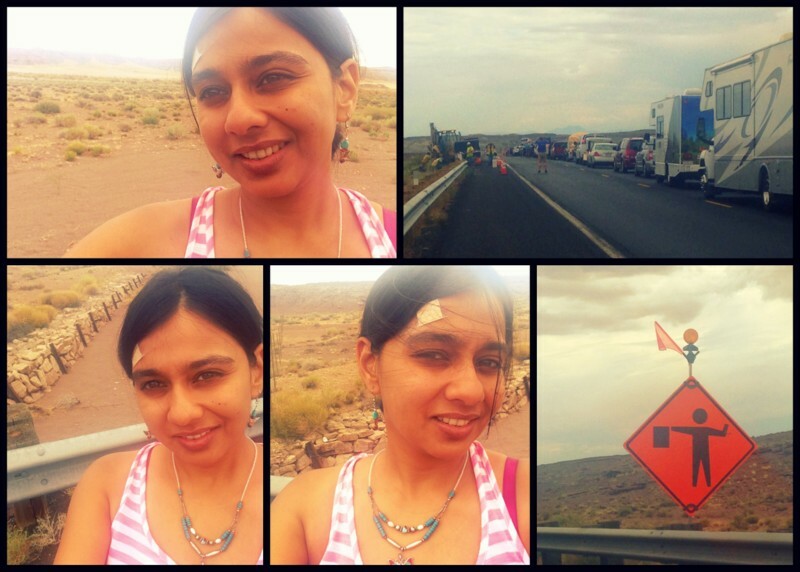 We drove past stunning scenery, and a herd of sheep till we reached a road block. Since the GPS wouldn’t help,we turned around and asked google maps to show us an alternate way. The GPS continued to insist we ignore the road block, even asking us to go off road at one point. Then we hit another block. A long line of cars ahead of us had come to a standstill. Soon a long line had formed behind us as well. The road ahead had been temporarily shut for re-tarring. Half an hour later we were on our way again. We reached Sedona close to sunset. To reach the town center we drove through the gorgeous Slide Rock Park, drinking in the view. The tired sun on his way home bathed the red rocks with his warmth and made them glow against the blue skies. Coral on Turquoise.I highly recommend rolling down your windows and breathing in the smell of this place. I can’t quite place it except that it was good. 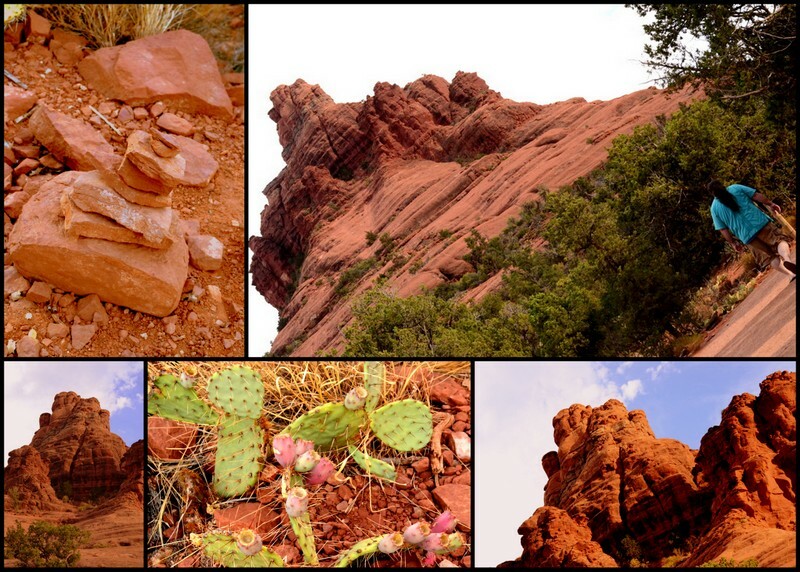 In Sedona, the husband wanted to go the see the red rocks while I was keen on checking out the vortices. A vortex is a spot where you can feel the earth’s natural energies. Some are positive, some negative and some neutral. I am not a believer, but I am inquisitive. 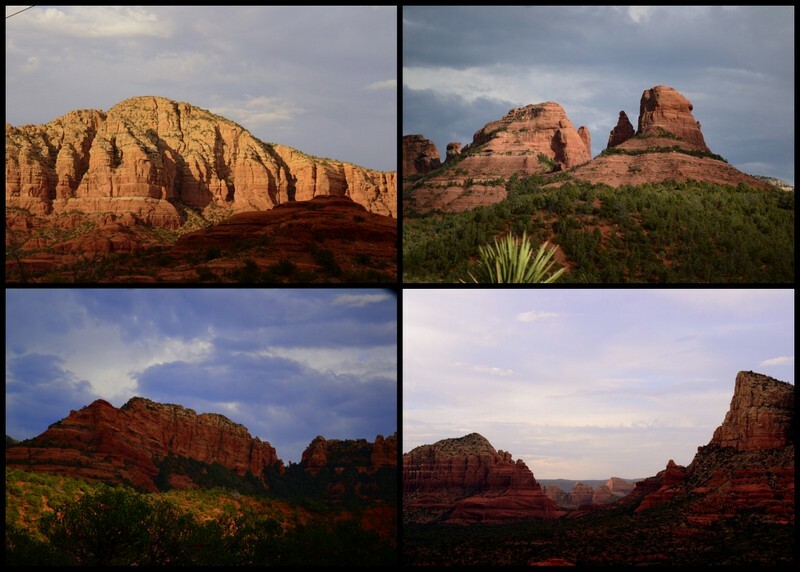 Finally we reached a consensus on where to go.The Bell Rock vortex was smack on the scenic byway, so we could do both. I decided the rock was calling me and acted on it. The stranger said there was a trail and if we couldn’t find it, “follow your heart“. Sure enough, there was a trail, but oddly a short distance later the trail just disappeared. From here the only way up was to scramble over the rocks. For someone who has spent her childhood summers scrambling over wave breakers at the local beach, it was fairly simple. The husband decided he preferred to stay where he was and take pictures. I stopped at the foot of the Bell. We were running out of time and the husband was already making furious gestures below. I sat down for a few minutes to feel the energies, but all I got was dirty looks from the husband. I didn’t feel any energy wash over me, or get a headache, or feel dizzy. I didn’t feel a thing. I guess I didn’t wait long enough for my own energies to cool off. Energy or no energy, the place is magnificent and the climb is fun. It probably gets progressively harder, which would explain the rush when you get to the top. We made it to Phoenix airport well in time for our flight. The flight took off on time and landed safely in San Diego. 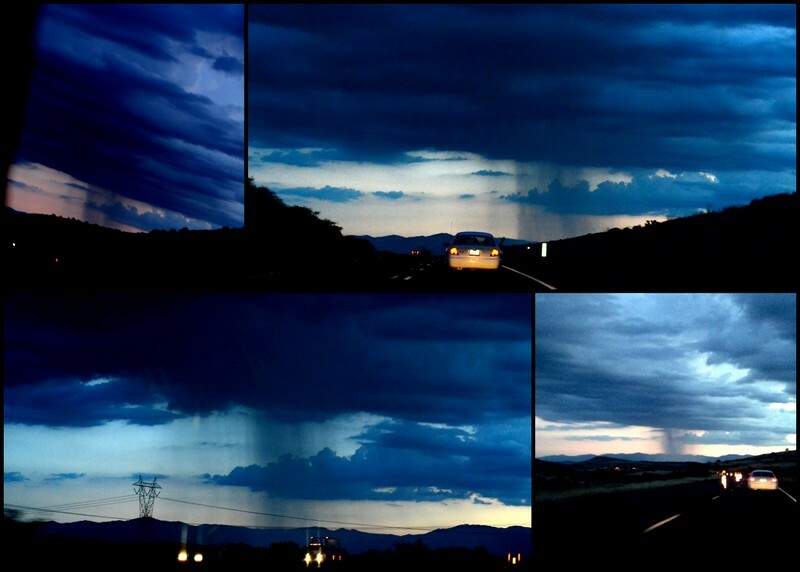 On the way to the airport we saw what I can only describe as this incredible beam of dark. 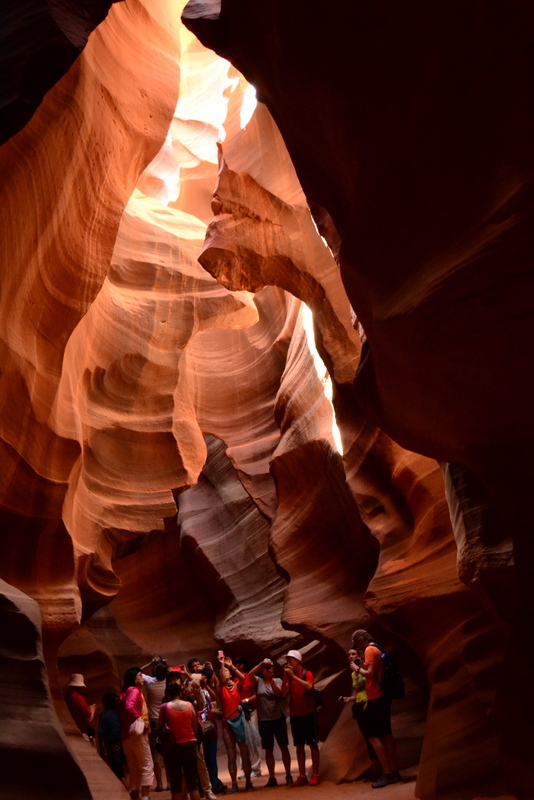 A perfect contrast to the light beams we went looking for in the Upper Antelope Canyon. From the disastrous start to the fabulous finish this trip has definitely been more than more than we bargained for. On the way back from the Canyons, our guide told us a little about the Navajo way of life; their traditions and beliefs. As I heard her speak, a thought formed in my mind ” Indians are Indians, Native American or Asian.” Did you know that in Navajos, children of siblings are considered siblings. This has given rise to using terms like “cousin-brother” and “cousin-sister” to define relationships in English and that the literal translation for your mother’s sister is “little Mother.” Another thing that is common with Hindu Asian Indians is that tradition dictates that Navajos do not eat when there is an eclipse. A very interesting titbit about the Navajos that I read online is that the Navajo language lacks a direct method of commanding another person and traditional Navajo consider it extremely poor manners to tell or order another person to do something. Our guide told us how her people wake up at the crack of dawn and end their day with the last rays of the sun; how they led their lives without electricity or running water; how she wasn’t allowed to wear make-up growing up. I can almost hear my mother ( grandmothers and aunts) saying, “Makeup is for grown ups who want to look younger. You are young. You don’t need makeup.” ” If you use makeup, your skin will get used to it and a day will come when you will look so haggard without it. You will then be forced to use makeup.” Our guide told us how her children hate it when she sends them to the reservation every summer to spend time with her family, and how they hate it when it is time to come back home. All those vacation we were forced to spend in Chennai come flooding back. Her words provided me insight into how at least a section of the Navajos felt about the “white man”. While the older generation was distrustful, the newer lot are more determined to reclaim their heritage. I must add here, that our guide at the lower canyon was much younger and didn’t seem to feel as strongly about the Navajo way of life. Our new plan was to queue up outside the Lower Antelope Canyon tour office at 7:00 am to get on the first tour at 8:15 AM or so and then do the upper canyon tour as booked at 10:30 AM. Before we went to bed, the husband changed his mind and said if we did it that way we would reach San Diego really late as the drive was too long. We agreed that we would drop the lower and do just the upper canyon. Early next morning we went to the tour booking office to see if we could move our Upper Antelope Canyon Tour from 10:15 AM the 8:30 AM slot. Turns out that was not possible as that tour was booked out and we could not cancel the 10:15 tour since it was no longer refundable. The plan then went back to run and catch the first tour to the lower canyon and make it back in time for the upper canyon tour. The lower canyon area can be reached only by a short dirt road. The tour offices are visible from the paved road, but it is easy to miss the turn. The coal power plant is an excellent landmark. The track goes off the road opposite the power plant. The power plant itself is easily identifiable with its three smoking chimneys. The marina is straight down the power plant road. Before you reach the marina, you will pass a statue of a bucking bull on the side of the road that the power plant is. If you are going to the marina, keep going straight. If you were headed to the canyon, turn around. Occasionally one can see a coyote crossing this road. Interestingly, the Lower Antelope Canyon was brought to public notice by the construction workers building the power plant. This area used to be their labour camp site. By the time we got the booking office, the first tour had already left, a few moments of discussion cost us a place on the second tour as well, but it is hard to refuse the girl with a big band-aid on her head so with some minimal pleading we got on to the tour. This canyon is below ground and is accessed through a series of ladders. Some ladders can be steep and few are missing handrails, also in some places the canyon gets really narrow but it is not at all hard to go through. The beauty of the canyons is such that it now haunts me wherever I go.A little bit of imagination will reveal a whole new world to you. 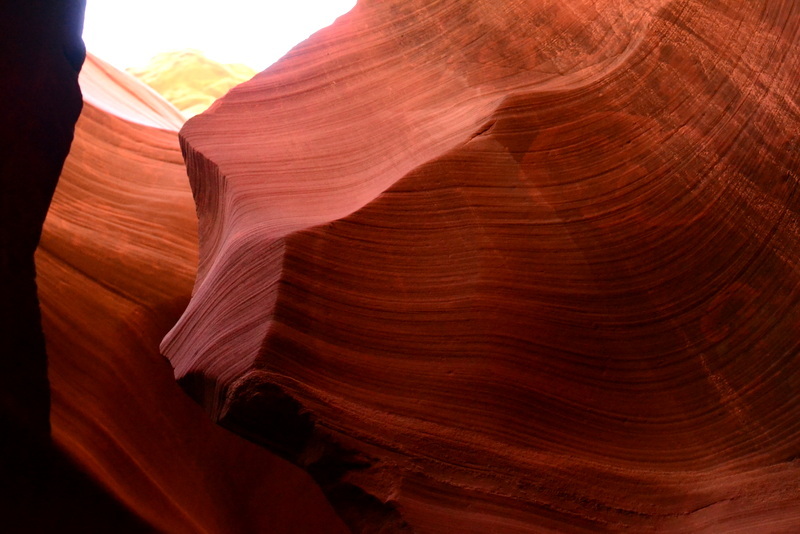 As light moves in the canyon, the walls change from red to orange to gold to every imaginable shade of pink. Run your hands along the walls and read the stories that water has carved into them. At every turn, wondrous shapes leap out, like pictures in a book. Read if you can the story the mountain lion or the thief or the eagle. The grumpy troll, the howling wind, the river goddess.. the stories weave seamlessly into each other and possibilities are endless. 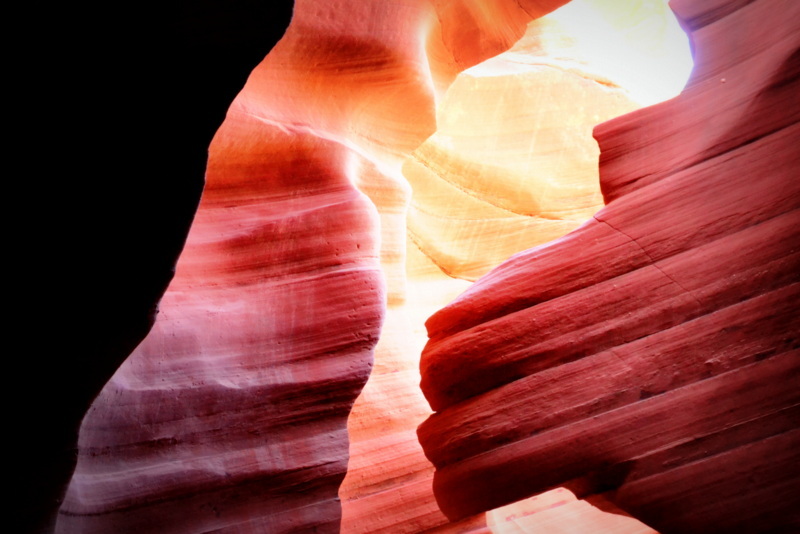 The fabulous shapes and spectacular colors turn the canyon from a mass of rock to a book of worship filled with extraordinary tales of sins and retributions. We walk around slack jawed and wonderstruck. We made it back to the tour office well in time for our upper canyon tour. The tour guide drives you down to the canyon with the rest of your group. If you are in one of the open vehicles, make sure to hold onto your hats. Our guide told us this was an excellent spot to pick up hats, because they keep flying off from the heads of tourists. A good part of the route is on bumpy sand, and on very dry hot days it is not unusual to see vehicles stuck in the it. It was not that hot when we went, but it was a hot day and for once in my life I was weather appropriately dressed in a pair of shorts, a tank top, a hat and sunglasses. 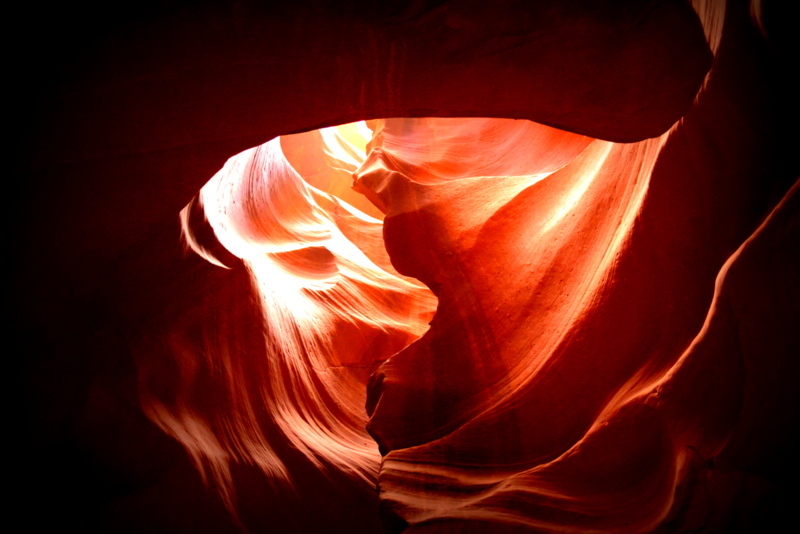 The rich hues that we saw in the Lower Canyon were not as prominent in the Upper Canyon.The draw of this canyon are the shafts of light that pierce through like messengers from another world. The imposing walls give it the appearance of a magnificent cathedral. An exalted place where spirits convene. No man-made structure can match it in grace. The little flecks of dust dancing in the beams add just the touch of reality to this surreal scene. Even so, if you have to choose between visiting the two, and are reasonably fit, make sure you do the Lower one. There are other less known and therefore hopefully less crowded canyons to explore like the Owl Canyon, Canyon X and the Rattlesnake Canyon . There are 6 canyons open to public here. Our Navajo guide assured us that the gorgeous colours and dancing light beams could be seen in other canyons as well, they are just not as popular because they are harder to access. 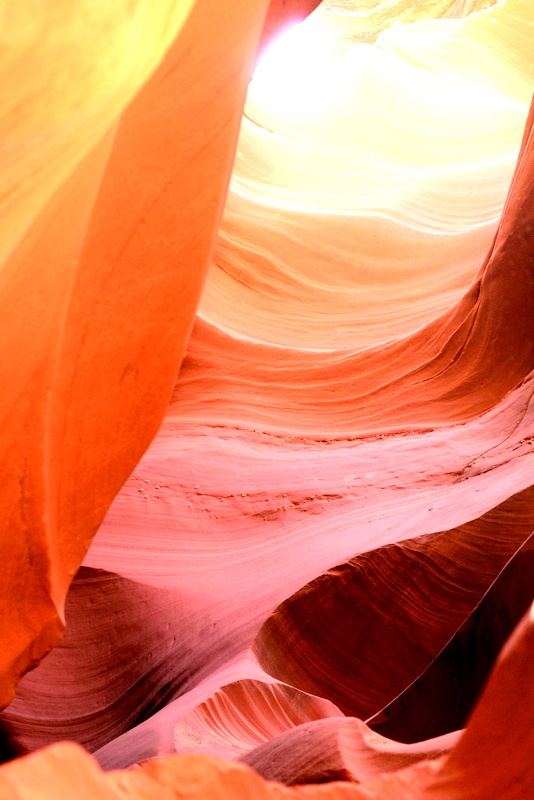 The Antelope Canyons were named for the antelope that used to roam freely in this area before human settlement and activity pushed them out. Great horned owls and rattlesnakes still populate these canyons. That is how those canyons got their names. 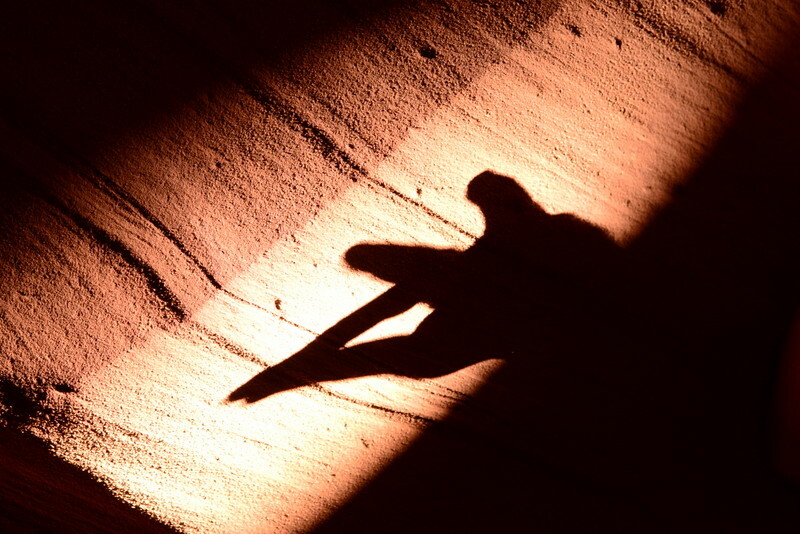 It is not uncommon to see owls in the Upper Antelope Canyon. We were not so lucky, but we did see their nests. We went with the Dixie Ellis company for the Lower Antelope Canyon tour and with Overland tours for the Upper Antelope Canyon tour. Both companies were very accommodating and both tour guides were wonderful. The guides also help you with setting up your camera and composing your pictures. We were informed by our tour operator that we could not have chosen a worse time to visit. Summer is not just hot, it is also thunderstorm season. Since the canyons are prone to flash flooding, whenever a flood warning is issued, the canyons are shut down for the day. This happens when it rains not just in this area but also if it rains heavily upstream. Summer is also peak tourist season. The best season to visit, in all respects would be spring. Another thing, if you are visiting during daylight savings period, please note Arizona does not participate in daylight savings but the Navajo Reservation is on Daylight Savings Time. Sometimes your phone or car clock may not grasp this automatically, so every time you cross the reservation border reset your watch, or keep it in mind. It gets more complicated because the Hopi Reservation, which is surrounded by the Navajo reservation, stays on Arizona (Non-Daylight Savings) time. I am not sure if you can do a guided tour of the Navajo reservation, but you can do one of the Hopi reservation. These tours are not very expensive and would give you an insight to the lives and customs of Native American/American Indian tribes. I didn’t known about this, or we would have definitely tried to squeeze it into our trip. You do however get to interact with the Navajo people as entry into the Canyons is not permitted without a Navajo guide, not even to Navajos. The Canyons are on reservation land. Another thing we didn’t do was go to Bearizona. Our waiter at Dennys told us about it. It sure looks like fun. If you are wondering where Dennys came in, we stopped at a Dennys for dinner, on the way from Phoenix to the Grand Canyon. Page is probably the best place to be if you want to disconnect from the world. The whole time we were there, our phones had very patchy reception. Mine worse than the husband’s. I have an iphone5 and we are both on AT&T, so this could also be a phone and service provider issue. I had a similar problem at the Grand Canyon as well, only there I had some internet connectivity and zero phone signal. The husband had both phone and internet connectivity there. He has a Samsung Galaxy S3. 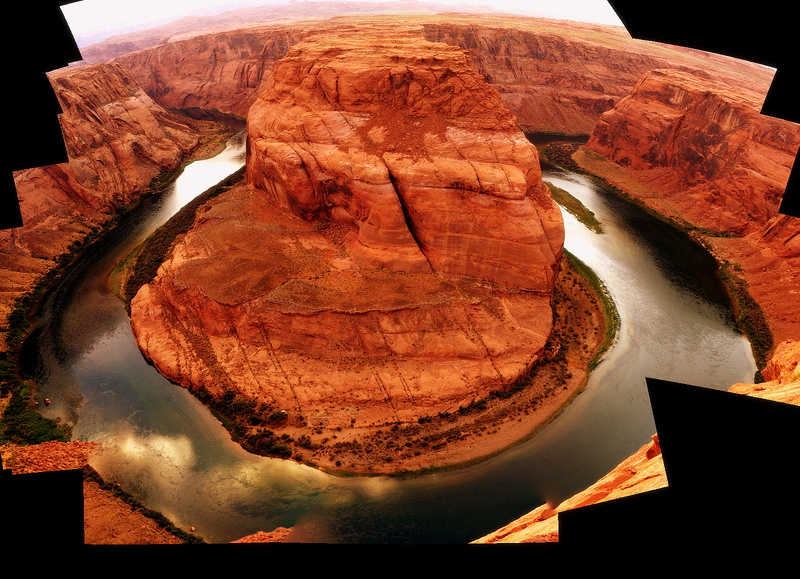 The drive to the Horseshoe bend is around 15 minutes from the Canyons and the Marina. Most attractions in Page do not have GPS addresses, and AT&T has terrible service around here so you better brush up on your skills at following an old fashioned map. To get to the viewpoint from the parking lot at the Horseshoe bend, you have to walk around 3 quarters of a mile on sandy soil. It is not a hard walk, although it may seem slightly harder on the way back, and the striated rocks form small natural stairs. The horseshoe bend on the Colorado river was as breathtaking as the pictures we had seen. We managed to time this perfectly. Getting there too early would have meant having to brave the late afternoon heat and you also need to beat the crowd to get good seats. We made the mistake of carrying our fixed lenses (50mm and 35mm). The scene is so wide, that it would be best to carry a wide angle lens or a lens that zooms out. Since the place is so dusty it is not advisable to change lenses there. The sun sets right behind the rock in the bend, creating a stunning visual. The picturesque sunset was followed by glamorous flashes of lightening. Word of caution, you need to put yourself out on the edge to get a view of the whole bend and there are no safety railings. I fell off the bed that night and hurt my head very badly. I bumped my head so hard on the carpeted floor that I could feel it at the base of my neck. The skin of my forehead was so badly scraped that it needed a band-aid. The next day the Husband was subjected to some pretty amazed and very curious looks when I told people who asked about it that I fell off the bed. 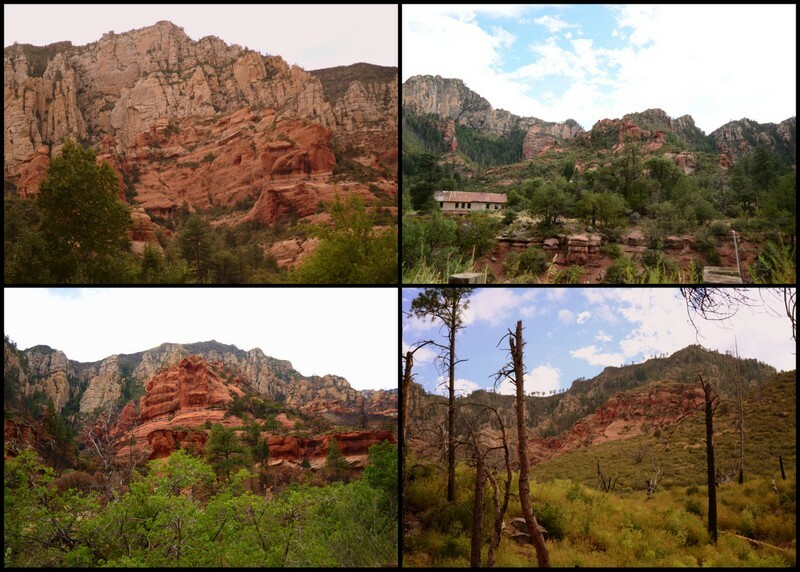 Day 2 – The Grand Canyon and the Antelope Canyons – What can go wrong – part deux. The next morning we had to be up by 4:30 am in order to catch the sunrise at the Grand Canyon. Having already missed the cheat option of watching the sunset, we just had to do the sunrise. 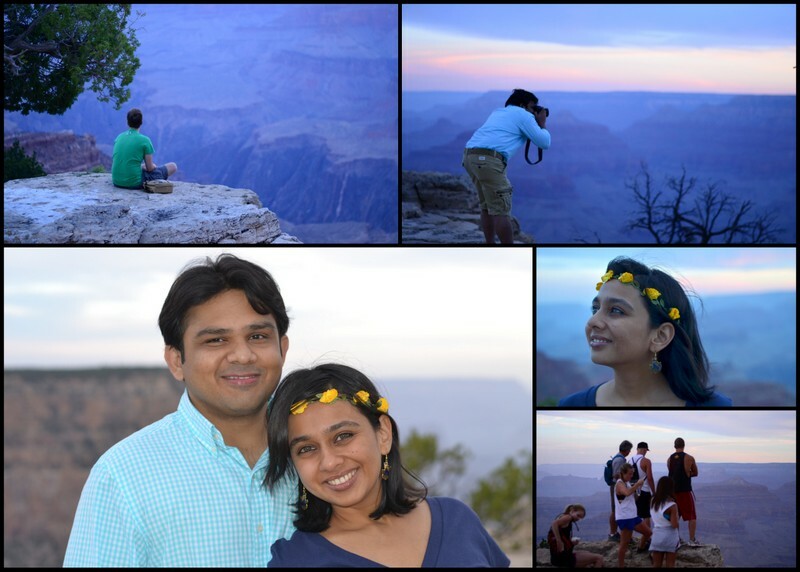 Surprisingly, we managed to wake up, drive down to the canyon and walk up the South Rim trail well in time for sunrise. After logistical confusion killed the idea of camping on the Desert View campground, we booked ourselves into the Grand Canyon Inn, a comparatively inexpensive motel a 20 minute drive away from the South Rim. The room we got had comfortable beds and a clean bathroom. They also have free wi-fi. As much as we would have loved to explore the less touristy North Rim, our tightly packed schedule allowed us very limited time at the canyon, so we settled on the more popular South Rim. We did a small portion of the Rim trail. On our way to the canyon, we saw signs that warned of natural fires ahead. We assumed the lightening storm last night had started forest fires. Later someone we met at the end of the trail told us that the authorities were carrying our control burns. We got on on the trail right behind the El-Tovar hotel. When we started walking, we were only people on the trail, and the first people to reach the end. The walk is quite easy, but if you don’t want to do it there is a fantastic view point right at the beginning. I had heard and read from several sources that the sight of the first rays of the sun hitting the red rocks of the canyon was magical. That glorious glow of redness as the darkness suddenly lifts, has been described as mystical. Grand as the Grand Canyon looked that early morning, the smoke and the looming thunderstorm ruined the sunrise experience for us. The dining room of the EL Tovar is a great place to grab breakfast after doing the trail. If you ask me to describe the Grand Canyon,I would say it looks like a number of magnificent temples dedicated to the great Gods of the old. Over millions of years wind and water have carved the mountain face to create beauty fit for worship. After breakfast we started the next leg of our trip. We were going to Page, to photograph the Antelope Canyons and catch the sunset at the Horseshoe Bend. On the way we stopped by at the Desert View point. This is just another vista point for the Grand Canyon. On the Rim Trail, a couple who have done multiple hikes in the Canyon told us that there is a trial that leads to the bottom and there is a waterfall there. Something we would definitely like to do on our next trip here. The route from the Grand Canyon to Page is very scenic and is dotted with a number of distractions. 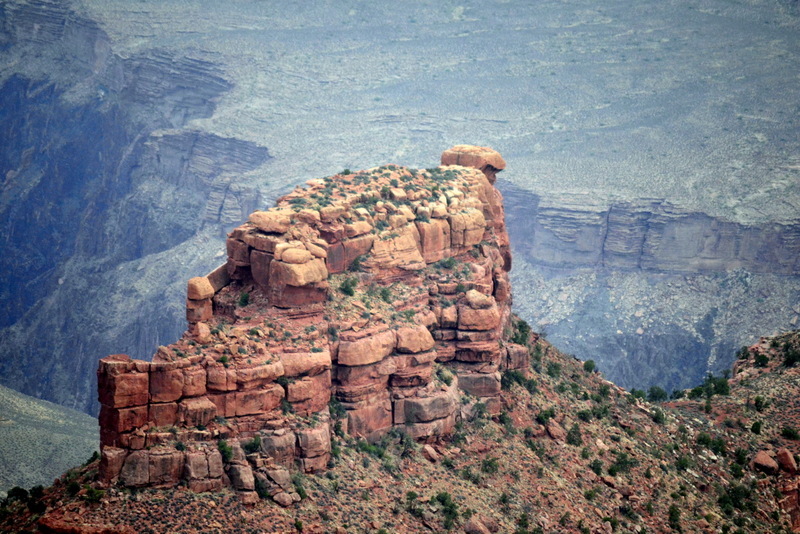 There is the overlook on Little Colorado, the Cameron trading post, the Echo Cliffs, the painted desert and the Vermilion Cliffs. On the way there is a little side road (US89A) in Bitter Springs that takes you to the Navajo Bridges,Marble Canyon and Lees Ferry. On the way to Lees ferry are some remarkable rocks like the Mushroom rock and Balanced Rock. This information has been gleaned from Trip Adviser and we really didn’t have time for most of it. We did stop though, at one of the Navajo (pronounced Naa-va-Ho) stalls and picked up some pretty jewelry. If you plan to include the Vermilion Cliffs in your itinerary, there is a parking lot with Navajo stalls that has great views of Vermilion Cliffs. This information is again from Trip Adviser. We knew we would be cutting it too close for our reservations on the Upper Antelope Canyon Tour so we called the tour operator and had them shift it to the next morning, so we would do just the Lower Canyon and the Horseshoe Bend today. As we got into Page, the hot summer sun was sudden blocked out by ominous dark clouds. Just our luck!! By the time got to the Lower Canyon tour office, the rain had stopped, but the damage had been done. Both the Upper and Lower Canyons are prone to flash floods and once it rains they are closed for the day. Since there were a couple of hours left before sunset, we decided to take a boat ride on Lake Powell. It is a pleasant way to pass time. 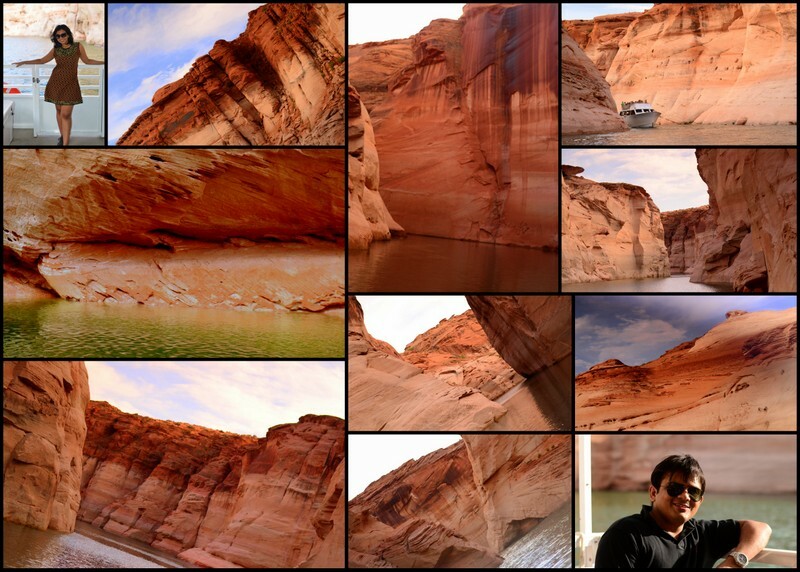 I thought the boat would go all the way to the Navajo bridges, but they only take you as far as the Lower Canyon. Do it by all means if you have some time and money to spare, or have just been having a rough time like us. From the Antelope Point Marina we drove down to the Horseshoe Bend well in time for the sunset. When we reached the gate to board our flight from LA to Phoenix, the agent at the gate scanned our passes and then scanned them again to verify something. The husband and I looked at each other and braced ourselves for the worst. She smiled brightly and said, “I don’t know why, but they have changed (our hearts sink, not another flight please!!) your seats. You now have seats __ and __, but the flight is not full, so you could try and switch once everyone is seated.” Almost as soon as she finished the sentence the husband responded, “We’ll take it!” At this point we really didn’t care what our seat assignment was, all we wanted were 2 seats on a flight to Phoenix.When we finally reached Phoenix, I was ready to fall on my knees and kiss the ground. A lightening storm is an awe inspiring spectacle, but when you see it at night, from the window of an airplane it feels more like dark demon grinning manically at you. 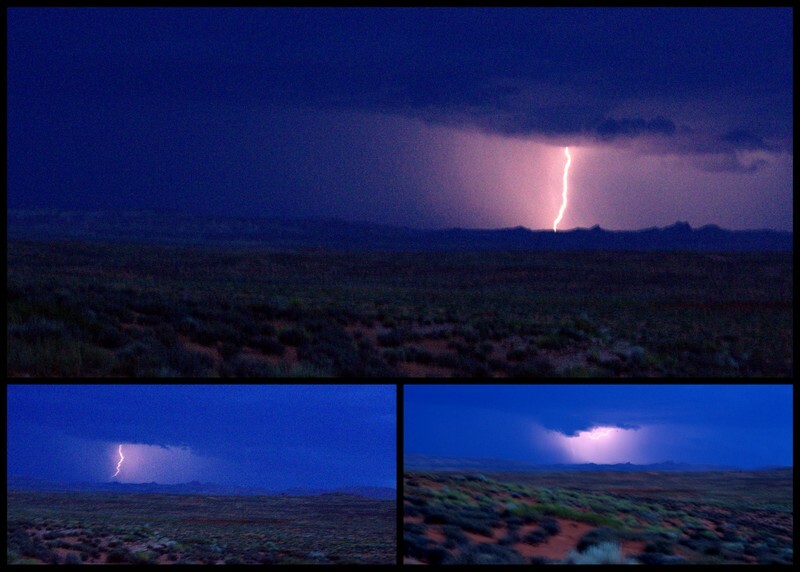 As we approached Phoenix, we could see flashes of lightning jarring the dark night sky. Luckily it didn’t affect landing. Even more luckily, my bag was waiting for me at baggage claim. After spending a good 10 minutes deciding on a rental car, we picked a bright red Kia and drove out into the lightening storm. Nature had put on quite a show for arrival. Four hours later, we reached our digs for the night at 2 the next morning. Almost twelve hours later than we had planned! Our big trip dates have finally arrived. We woke up at 4 this morning to make it to our 7 am flight. We decided to use public transport to get to the airport because, well because we have access to it. Mistake no. 1. – we did not check to timings. As we lugged our luggage down the stairs at Journal Square station, the wheel broke off one of the roller bags. The first in long series of unfortunate events. At the bottom of the stairs, we realized we were on the wrong platform. We reached the Newark station, only to realize if we waited and took the air train, we would never make it in time for flight. So we took, what can only be described as a leisurely taxi ride to the airport instead. Our flight was via Texas and since that flight was full, American Airlines (AA) was offering courtesy baggage check-in which I happily decided to avail. That was mistake no. 2 I must have been really hungry, because before checking my bag in the only thing I grabbed from it was not my wallet or cannot-afford-to-break-them sun glasses, I grabbed a bag of oranges. The Husband’s disbelieving I-don’t-know-what-to-say-to-that-look sent me rushing out of the aircraft, back to the gate to retrieve the said items. It must have been the kajal and the danglers that did the trick, the ground staff actually brought the bag back for me to take my wallet and glasses out. Little did I know, this would not be the end of this issue, but more on that later. As we settled in and waited for the flight to take off, the captain announced that the flight was delayed as a component of the communications system was not functioning and they were waiting for a technicians to come take a look. Surprisingly, 15 minutes later we were airborne. 1. To take a flight to Reno/Tahoe and a connecting flight on their partner US Airways to Phoenix. this flight was due to depart in 20 mins. 2. To be waitlisted on a direct flight taking off an hour or so later, and a confirmed ticket on a direct flight almost 4 hours later. This last flight would reach 1 hour after the roundabout trip offered in option 1. Pretty certain that we would not be accommodated on the next direct flight and would have to wait for 4 hours in the airport, we took option 1. Mistake 3. We regretted it almost as soon as we boarded the flight. We would be flying for 2 hours away from our destination, and then again another 2 hours or so to it. Essentially we would be wasting time in airplanes instead of an airport. When we reached Reno our worst fears were confirmed. US Airways did not have space on that flight. After wheedling and pleading, and someone else not turning up they agreed to put us on that flight, and here we come back to our baggage problem. They had one condition though, that our checked in bags go with us, or AA provide them with reasonable proof of location of the bags. Since AA could do neither, we got stuck on yet another roundabout trip, this time Reno to LA and then LA to Phoenix. Once we were seated in the into aircraft to LA, the Husband asked the flight attendant what time the flight was expected to arrive in LA. Believe it or not, she said, “I can’t say. We haven’t even taken off yet.” Seeing the husband’s stunned expression she did go on to clarify, that the flight time was 45 minutes but taxiing eats up a lot of time. We’ve reached LA now and are waiting for our connecting flight. I hope my bag is waiting for me at Phoenix. Our plans to catch the sunset at the canyon have been completely ruined. If all goes smoothly from here we will reach the hotel by mid-night or in the wee hours of tomorrow morning. We’ve slept through most of this flights, but I hope fatigue does not get in the way of our plan to watch the sun rise over the Grand Canyon tomorrow. Even as I am typing this, the husband is trying to sort out the reservations. Tomorrow is another day, and I sure hope it will be worth this one!